The University of NSW (UNSW) is set to commercialise its quantum computing technology with the launch of what is being touted as Australia’s first quantum computing company. The $83 million venture, from which the new company, Silicon Quantum Computing Pty Ltd, has emerged, has received backing from UNSW itself, which has contributed $25 million, as well as the Commonwealth Bank of Australia and Telstra, which are contributing $14 million and $10 million, respectively. This is in addition to the backing by the Federal Government which, through its National Innovation and Science agenda, which is also investing $25 million in the next five years in the company, and the NSW government’s contribution, which is putting up $8.7 million. The creation of the new company is intended to help drive the development and commercialisation of a 10-qubit quantum integrated circuit prototype in silicon by 2022 as the forerunner to a silicon-based quantum computer. The company will work alongside the Australian Research Council (ARC) Centre of Excellence for Quantum Computation and Communication Technology (CQC2T), operating from new laboratories within the Centre’s UNSW headquarters. Speaking at an event to launch the company at UNSW on 23 August, chief researcher and board member, Professor Michelle Simmons, said that the three-way collaboration between government, industry and universities was “unique internationally”. “I know the rest of the world is watching us,” Simmons said. The creation of the new company is expected to see up to 40 staff hired, including 25 postdoctoral researchers, 12 PhD students, and lab technicians. Recruitment is already underway. Silicon Quantum Computing’s board members include Simmons; Hugh Bradlow, Telstra’s Chief Scientist; David Whiteing, CBA’s Chief Information Officer; and Glenys Beauchamp, Secretary of the Department of Industry, Innovation and Science. The board will be chaired initially by corporate lawyer and company director, Stephen Menzies. Interim Chair, Stephen Menzies, said that the public-private partnership was a new direction for the commercialisation of Australian research, and that the company would maintain vital intellectual property in Australia and develop a “nascent quantum information ecosystem” in NSW, he said. “We have a board that is very corporate-focussed on developing and funding the engineering work to develop a 10-qubit device,” Menzies said. “We will fund hardware, but from that we will also develop a patent pool that will be without peer in the world. And that patent pool will allow us to work with other Australian institutions and corporations to lead to further innovation in the quantum age,” he said. The Federal Minister for Innovation, Industry and Science, Arthur Sinodinos, said that quantum computers were expected to change the way we live, work and do business in the coming decades, creating new jobs in new industries. 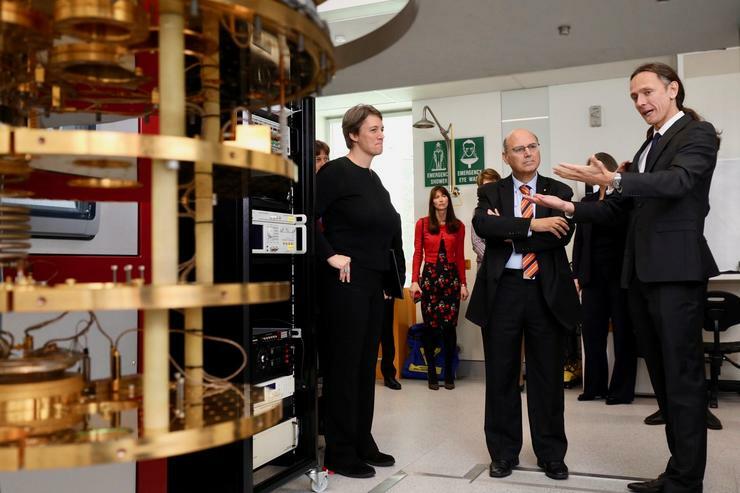 “The power and potential of quantum computing is game changing,” Sinodinos, said. “This is going to offer enormous advantages for a range of sectors, including finance, security and transport. “Silicon Quantum Computing is a prime example of how governments, researchers and business can work together to translate great Australian research into commercial reality,” he said. Quantum computing has been gaining momentum in Australia, with Microsoft recently striking a multi-year global agreement with the University of Sydney resulting in funding for state-of-the-art equipment, recruiting new staff and developing talent.